As we awoke in Sedona, the warm air against our faces raising us from our slumber, we jumped out of the van, grabbed some fresh air, organized a little, and headed into town looking for breakfast. There is only one road that passes through Sedona and every few miles has a little town with shops and eateries. We headed north bound as thats where we needed to head after eating anyway, and found the last of the little towns on the main road. We drove looking for anywhere cozy and local and found that within The hitching post restaurant, inside smelled of eggs and waffles,the waitress a friendly older lady with a spunky personality asked what we would be having and brought out some much needed coffee. Upon finishing our meals we walked the town and checked out some local shops before heading back to the van to head north. The roads leading out of Sedona leveled out quickly and stayed straight and baron for the two plus hours we had on the road, no signs of civilization minus a few make shift ranches and some farm animals, vegetation was at a minimum only seeing small cacti and shrubs sparsely lining the roads. We made our way into the National Geographic Greeting Center for the Canyon and talked with a ranger and grabbed some trail maps, All this time you could not see or tell how close or far you were from the Canyon. We parted ways and headed to the road that would bring us to our first over look, passing through the gates you could still not see anything, how could such a massive place be so hidden in plain sight we thought to ourselves. We breached the first parking lot and got out to walk towards the trail, as we turned a corner the canyon revealed herself to us in full glory,my mind couldn't comprehend what my eyes were seeing, no photographs nor videos did any of this justice. Crawling out onto narrow ledges surrounded by 1000 ft. plus drop-offs around us just to fully immerse ourselves more and try to understand the magnitude of this magical place. The canyon walls layered in brilliant reds, purples, and yellows, the sky above a piercing shade of blue. It felt as though one was living inside a painting, as our feet dangled we took in the sights and just breathed deep hoping a little of the magic in that air would last with us eternally. After enjoying the views for a few hours we headed further down to find the perfect spot to set up camp for the night, and prepare our gear for sunset. The spot we came across was on a long straight stretch of road, pulling into the parking lot there were only two or three cars with no more then eight people, which was much improved over the super crowded first overlook.The parking lot made a horseshoe shape and at the bend a walkway reached out to the canyon edge. Mountain goat trails scattered the area high and low allowing you to reach numerous cliffs edge each spot big enough for a personal moment of meditation. 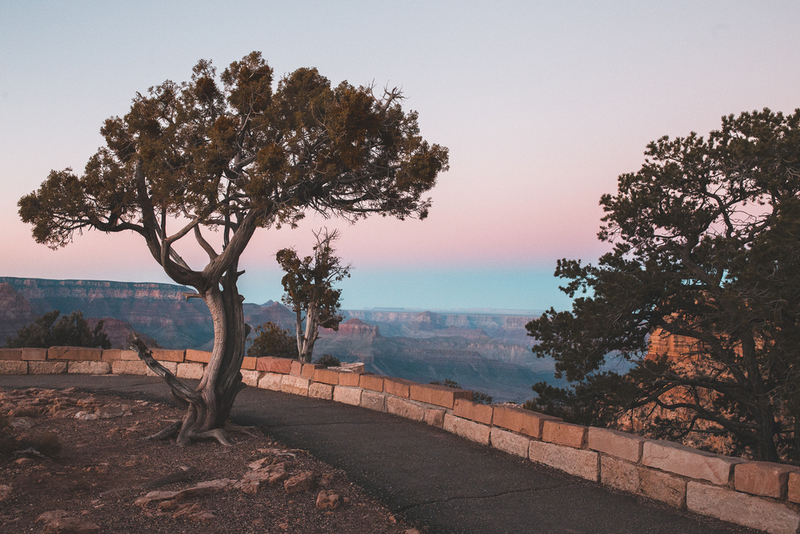 As the sun set the remainder of people cleared out and left us to ourselves, Theres something so incredible about being alone on the edge of the grand canyon as the sun vanishes. Right after the last sliver climbs below the canyon horizon the skies transform to painted shades of indigo, teal, burnt orange, and deep red. Gazing forward one could see where the color pallets that inspired the natives came from, my eyes never saw colors like this merge so seamlessly, as they shuffled the sky brought forth its next treat for us in the form of millions of twinkling stars dancing. We spent the remainder of the night hoping from cliff to cliff cameras in hand trying to capture even an eight of what are our eyes where witnessing.Star photography is rewarding in the sense that it makes you slow down and wait a minute, to sit and think while the exposure is being captured for a few seconds to a few minutes each time. You haven't experienced the night sky until you've sat on the edge of a cliff at midnight surrounded by all those little diamonds in the sky. We stayed up late that night, who would want to go to bed being where we were, once we felt ourselves start to get tired, we packed up our camera gear and cooked some mac and cheese in the back of the van before sitting on another cliff edge eating our meals, talking of the days prizes and planning for tomorrow excursion.That night was perfect, those few hours on the cliff edge at the grand canyon, i was at peace. Antelope Canyon & Horse Shoe Bend - " i want to do this forever "